This guide is about Elemental Enhancements. 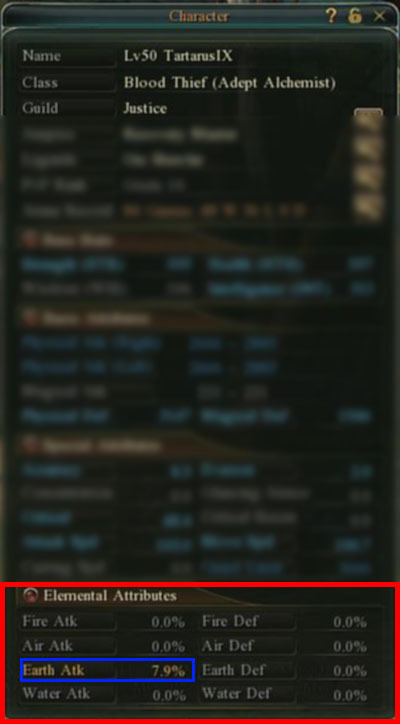 All the information i have gathered about elemental enhancement, I am putting them here.The materials and the information of this guide will be property of C9/Webnez. Enhancing equipments using these elemental stones adds elemental attributes of the corresponding element. Elements can almost never fail being added to equipment. However, Elemental Values are set on a 100:1% scale, for example +70 will added 0.7% your element attributes, while +240 will add 2.4%. Elemental AttributeElemental attribute of your chartacter can be checked in the botttom of your character menu. Increase in any elemental attribute increases the elemental attack or defence by a percentage. In my case, I have 790 Earth attack which shows as 7.9% Earth attack in the character menu. The elemental attributes can either increase your elemental attack or defence. There are two types of effect that can be expected from elemental enhance ment depending on the type of equipment (Weaponor Armor). Only Weapons and Armors that have Element Slot can be enhanced using elemental stones. Elemental enhancement of weapons DO NOT effect in PvP except for some skills that use the specific element that is added to the weapon. When armor is enhanced using an elemental gem, armor gains resistance to the specific element that was added. It is recommended to use a variety of elements (depending on scenario) since elemental resistance does not override each other like weapon element. Tje elemental enhance ment of armor are also available in PvP. You can enhance a weapon or armor with element buy talking to the Jweler. The Jweler is always Besides the Blacksmith in every town. After talking to the jweler select the “Element Enhancement” option. 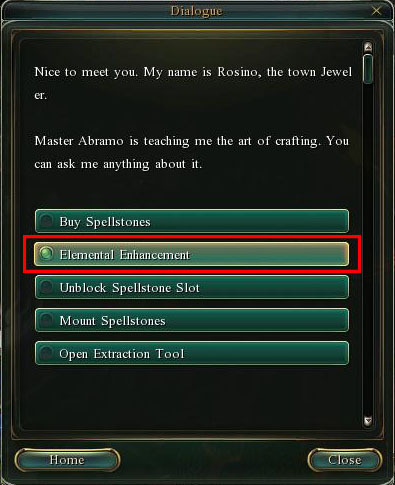 It opens the Elemental Enhancement tool where you can put the Elemental Gem and the Equipment to be enhanced in their corresponding slots. 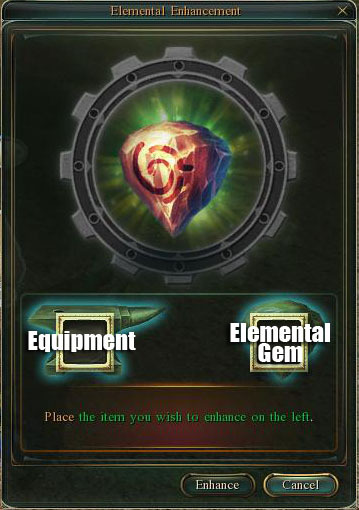 After placing the equipment and the gem in their corresponding slots, click on Enhance button and the elemental gem will be added to the blank elemental gem slot of your equipment. 1. It requires some gold to enhance equipment using elemental gems, which depends on the grade of equipment and gem. 2. If there is no blank slot available in the equipment. the gem will replace the existing gem in the first slot of the equipment. The existing gem will get destroyed in the process. Elemental gems have grades from 1 to 10 (I to X) which determines the amont of increase in the elemental attribute (Atk or Def) on enhancement by using the gem. Grade 1 provides the least amount (30) and grade 10 provides the highest (600). When multiple gems of same element are added to an equipment the attributes add up to define the total attribute of a specific element. Elemental gems of lower grade can be combined to get elemental gems of higher grade. Grade 1 and 2 can be combined directly using the Nitro Cube from blacksmith. For combining elemental gems(above level II) You need certain materials. How to create materials required for combining? Metal worker can use Earth Powder/ Earth fragtment to make crude/inferior/common Ingot of Earth. Wood worker can use Fire Powder/ Fire fragtment to make crude/inferior/common Wood of Fire. Chief can use Water Powder/ Water fragtment to make crude/inferior/common Solution of Water. Tailor can use Air Powder/ Air fragtment to make crude/inferior/common Bolt of Air.